In 2013, Samsung became the first to introduce a vertical TLC "V-NAND", a 32-layer cell structure based on Charge Trap Flash (CTF) technology and vertical interconnect process technology to link the cell array. By applying the latter technologies, Samsung's 3D V-NAND can provide over twice the scaling compared to its 20nm-class planar NAND flash. 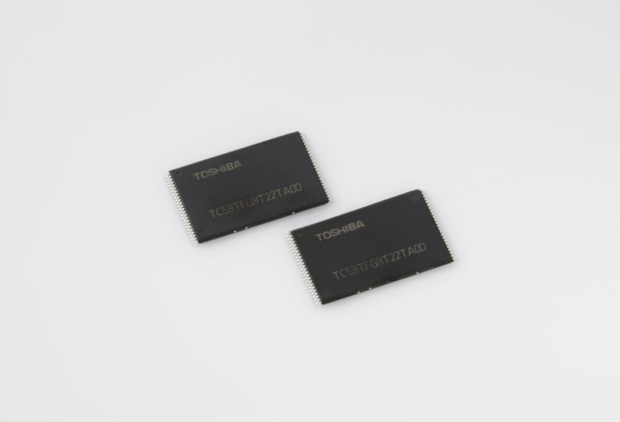 Toshiba announced earlier this year its 15nm NAND flash for embedded MultiMediaCard (eMMC). 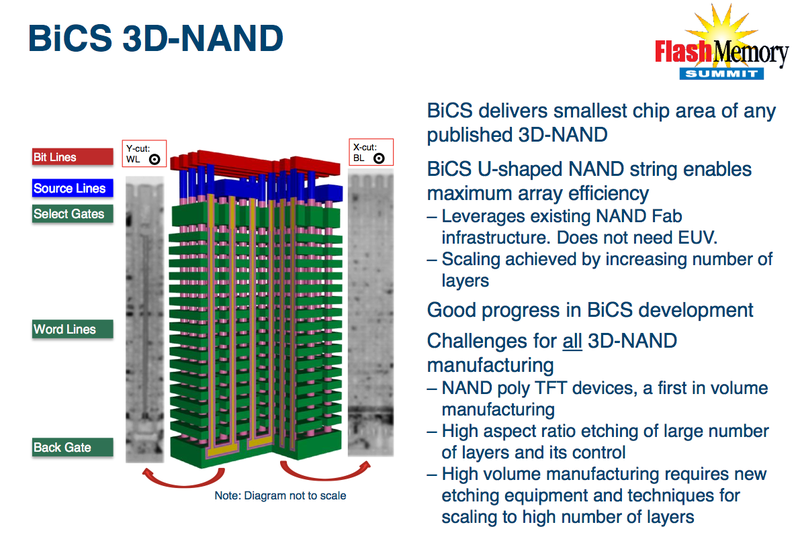 Toshiba and SanDisk will still be shipping their 15nm planar NAND for lower capacity applications as they develop 3D technolgoes with far greater density and capacity. Samsung's 3D V-NAND chip also provided two to 10 times higher reliability and twice the write performance of its previous planar NAND flash. Intel and Micron are developing a 32-layer 3D NAND flash flash based on a floating gate memory cell; they also recently announced a resistive RAM (ReRAM) memory called 3D XPoint. The 128Gbit chip, based on the new 3D XPoint technology, increases performance and resilience by up to 1,000 times over planar NAND. Intel and Micron said their 3D NAND will hold 256Gbits (32GB) or 384Gbits (48GB) per chip depending on whether it is produced in two-bit per cell or three bit per cell technology. 3D XPoint technology is a new class of non-volatile memory invented by Intel and Micron that relies on resistance change of the bulk material to achieve non-volatility. 3D XPoint technology uses the bulk material to switch resistance state and does not rely on statistically variable filaments, enabling it to reach manufacturing. The combination of architecture and unique materials in both the memory cell and selector enable 3D XPoint to achieve higher density, and better performance and endurance. 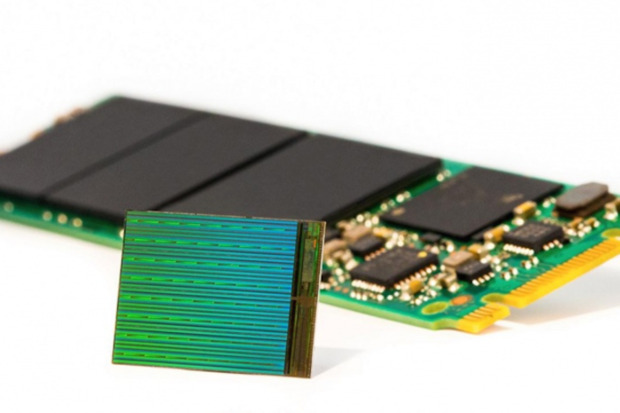 Toshiba's 48-layer 3D NAND based on charge trap technology. 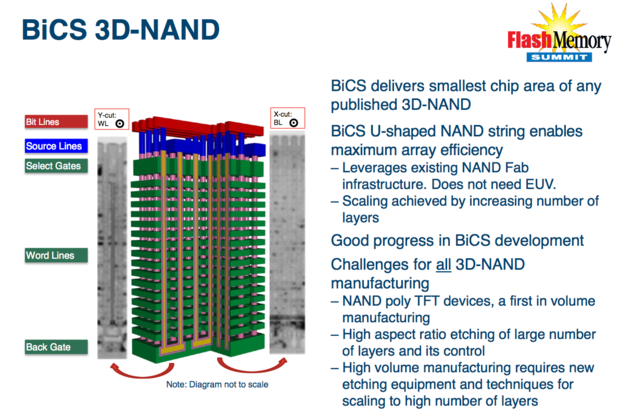 Toshiba and SanDisk's Bit Cost Scaling (BiCS) 3D vertical NAND design stacks 48 NAND cells one atop another like a tiny skyscraper.